Edible Schoolyard NYC is nonprofit that works to transform the hearts, minds, and eating habits of young New Yorkers through a seed-to-table education that is integrated into the school day. Children who participate in Edible Schoolyard NYC’s “edible education” help grow edible gardens on site at their school– and we are particularly in awe of one such aspect of the programming, which involves allowing kids to plan a menu around salads that they can grow themselves. At the beginning of the semester at the Arturo Toscanini school in Brooklyn, 5th grade students had the opportunity to “plan their salad” beginning with red leaf lettuce, kale, and mizuna seeds that the children planted at the beginning of spring. One of these classes took place in the school’s beautiful on-site greenhouse, and the other was outdoors in the garden, where students prepared the beds for planting. Each student was given their own bed to take care of in the spring, and so during this class they mended the soil, sifted compost, added compost to the beds, weeded the beds, and several other tasks that ensured each child’s connection to the land from which they would eventually eat. In a kitchen class that bracket’s the school’s gardening class, the students have two dedicated periods in which they’ve done everything from making pizza (with peppers and tomatoes grown in the garden) to sushi, smoothies, spices, and more. 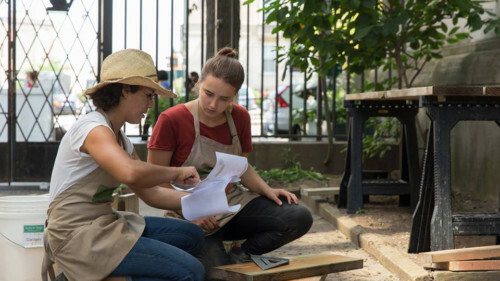 With back-to-back gardening and cooking classes (the former of which often involves tasting, one student’s proclaimed “favorite part”) each student is able to see the cycle of growth from seed to table in the course of a single semester– which is particularly powerful in an urban environment with no visible farms in sight. Later in the semester, just as leafy greens started to emerge lushly from the soil, students reconvened in the on-site gardens to plan what salad dressings they would like to pair with their salads. This is when the culinary aspect of Edible Schoolyard’s mission comes into play, because, to quote the great guerilla gardener Ron Finley, “when kids grow vegetables, kids eat vegetables” (which is true: according to one study, kids are five times more likely to eat vegetables they grow themselves). Thus, after a long semester of waiting, the salads were harvested and served– and nobody was happier about it than the kids.